Gutekunst said he knew when he went down to 27, that he would have a chance to get back up in the first round and that he did. 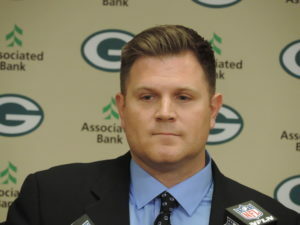 The Packers sent the 27th pick, along with third (number 76) and sixth round (number 186) picks to Seattle for the 18th pick in this draft as well as a seventh round pick (number 248) this year. So the Packers will start day two with a second round pick (number 45), no third round pick and a total of 10 picks on Saturday. It would appear to be safe to say that Gutekunst isn’t done dealing and we shouldn’t be surprised if he uses some of that day three ammunition to climb back up into the third round on Friday night. Depending on what publication you look at, Alexander is either listed at 5’10 or 5’11. The Packers obviously don’t feel Alexander’s height is going to be a problem. “I’m a big believer in heart over height,” Alexander said. “If you look back at the film, I only gave up five passes, and I played against bigger receivers who were 6’5. It doesn’t really matter. What Alexander does have is speed. He ran the 40 yard dash in 4.38 seconds at the NFL scouting combine. Alexander was initially recruited to Louisville as a receiver but made the switch to defense as a freshman in 2015. He tied for second in the ACC with five interceptions as a sophomore but then ran into some injury issues as a junior last year. Alexander explained that he had a bone bruise on a knee in Louisville’s opener against Purdue and missed the next four games. After returning, he suffered a hand injury and played just three games the rest of the way. The Packers say they are not concerned about his durability. So the Packers not only got a player they had targeted before the draft, but they secured an extra first round pick in next years draft. Alexander is also expected to give Trevor Davis a run for his money as the Packers punt returner, which is something he did well at Louisville.